Make you Apple device look a bit more classy with a picture of Audrey Hepburn on it. This case shows a classic portrait of Audrey Hepburn agains a silver grey background and the portrait does not stop at the edge it keeps going around to the sides. And this picture is not just printed on the case no the image is actually printed in the case so that even if you would scratch it the image will still be there. And each of these case will look stunning and protect your device from harm. Like any good case this hard case will also keep all the ports and buttons available for you to use. If you like Audrey Hepburn then come and check out this Audrey Hepburn iPhone And iPod Touch Case. We all know that taking some picture with your iPhone or iPad is difficult to do without having the camera shake. Specially with macro and low light photography this can be a real challenge. Yes there are bluetooth solutions that help you with that but often they don’t work with most apps. Now there is a remote shutter that works with most apps including the Apple camera app. This remote camera shutter comes with a retractable cable that goes in to your headphone jack and on the other side you have a button that looks like an old film cartridge. That is all and with this you will be making amazing photo’s in no time. This setup works with iPhone 3GS and up, iPad 2 and up and iPod Touch 4th generation and up. 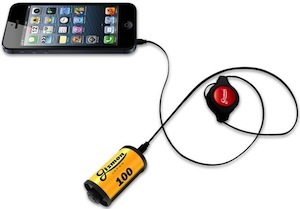 So come and check out the Gizmon iPhone Remote Camera Shutter. Is carrying a stylus not very practical because they are big and bulky? No worries there is a solution for that. This stylus is tiny and stores in any 3.5″ headphone jack. 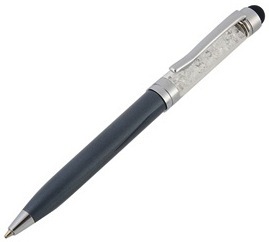 And this quality stylus works fine on any capacitive touch surfaces that is used by most smartphones and tablets. So you iPhone, iPad, Droid, Blackberry or Samsung Galaxy device can all enjoy this tiny stylus. And besides being an amazing stylus for on the go it also block the headphone port so that dust can’t enter. Come read about all the details about this Dust Plug MicroStylus. 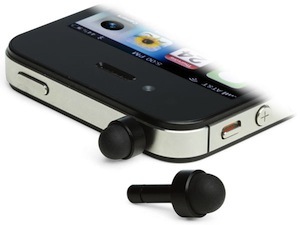 So you got a nice case for your iPhone or iPod and now it will not fit any more in your dock. No worries this dock extender will make it possible to use your dock as it suppose to be used only now you iPhone just stands a little bit higher. This extender makes it possible to use your case and a dock or alarm clock without having to remove your case. Come have a closer look at this Cosmos 30 Pins Dock Extender. OK so your iPhone and iPod touch already have an Apple on it but does it look so nice as this Apple? This case is white and on there you see an Apple made out of all kind of fun coloured jigsaw pieces. It make is all look very clean and sleek but still fun and colourful. 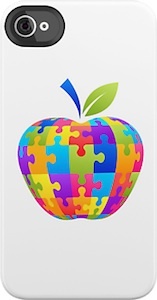 So if your favourite Apple device does not have the ultimate protection from harm then you should check out this fun Apple Jigsaw Puzzle iPhone And iPod Touch Case. 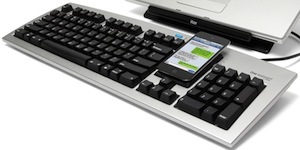 Why use your on screen keyboard when you can use a real keyboard to type on your iPhone, iPad or Android device. This keyboard will work as keyboard for you computer and can switch easily to your mobile device so that you can type on there as well. Text messaging was never easier. You can switch on the fly between devices so and that makes life a lot easier. This keyboard comes in a PC and Mac layout so that you can get the keyboard you need. The keyboard uses a USB connection to the computer and bluetooth for the mobile devices. Besides being a keyboard it also has a 2 port USB hub build in so that you can now easily connect your flash drives. A keyboard like this is what we all have bin waiting for and now we can use The One. Come check out this amazing keyboard come see The One Keyboard. You iPhone, iPad or iPod all came with an sync / charge cable and they work but they are boring. Now you can get a nice cable with build in led lights. Yes it is a normal data cable but there are lights build in to the wire so when you plug it in you can see the lights almost like you see your iPhone charge. 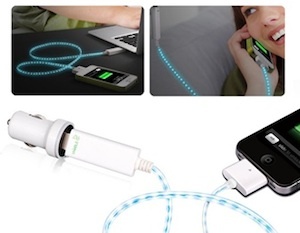 This cable is fun and the perfect way to lighten up your desk or car while charging or syncing your Apple device. Come check out this special Apple Data Cable With Build In Light. By now we are all used to the clean and boring docs that fit you iPhone or iPod but why go for boring when you can get something more exciting. This dock is a same kind of dock as the boring once but this one has a snowman attached to the back so it looks way more fun when you look at it. 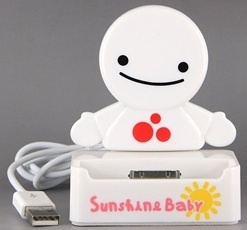 And it even has “Sunshine Baby” written on the front. 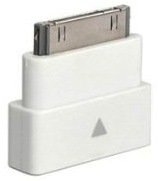 This dock is great to charger you iPhone, iPod touch or a different iPod. Come have a closer look at this Snowman iPhone / iPod Dock.